IKEA employed this strategy brilliantly in an ad campaign showing an unhappy woman next to an expensive custom cabinet containing one pair of shoes opposite a modestly priced IKEA cabinet overflowing with shoes. When we choose to spend $10 more than usual for a bottle of wine, we'll have $10 less to spend on an appetizer or a dessert. That's known as the "opportunity cost" of that choice. 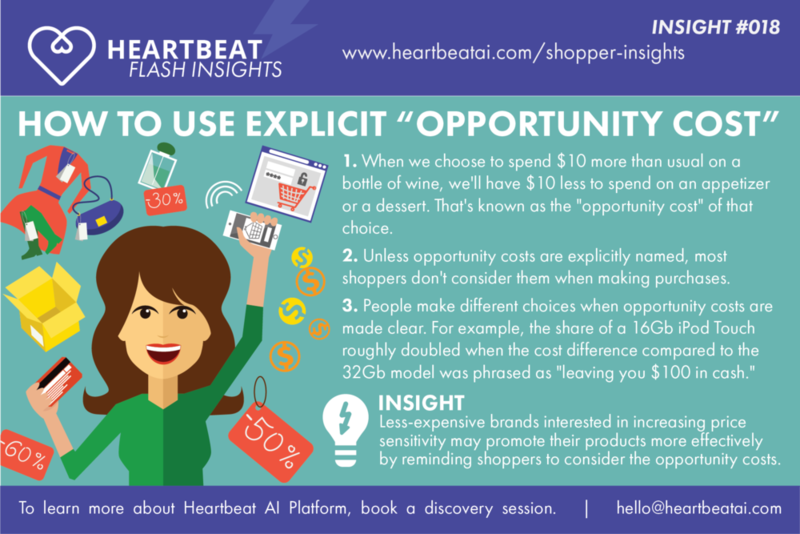 Unless opportunity costs are explicitly named, most shoppers don't consider them when making purchases. Shoppers tend to make different choices when opportunity costs are made clear. For example, the choice share of a 16 Gb iPod Touch roughly doubled when the cost difference compared to the 32 Gb model was phrased as "leaving you $100 in cash." Less-expensive brands interested in increasing price sensitivity may promote their products more effectively by reminding shoppers to consider the opportunity costs.